ART is the story of what happens when Serge buys an expensive painting, a white canvas with a few white lines, and the reactions of his friends, Marc and Yvan, to his purchase. Marc responds with shock and anger. For him, Serge's purchase of the painting is a cruel joke. As their arguments become less theoretical and more personal, they border on destroying their friendships. NON-TRADITIONAL CASTING/ALL ROLES ARE OPEN. 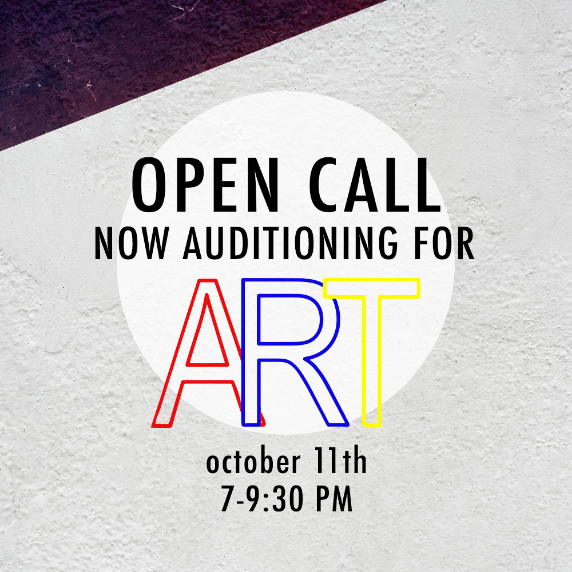 NON-EQUITY ACTORS OF COLOR STRONGLY ENCOURAGED TO AUDITION! No pre-registration is required. Audition sides from the script will be provided at auditions. Marc - A very good friend of Serge’s, but not necessarily a modern art fan. Marc is somewhere in his 40s, an aeronautical engineer, a practical, down to earth man. He is not married but has been seeing the unseen Paula for some time. Serge - A 40-something dermatologist who has had his eye on this white-on-white painting by the modernist Antrios for some time now. He has found peace in the realm of Modern Art where the old rules are thrown out and acceptance and instinct govern what is valuable. He does not appreciate Marc’s disapproval of his choice, and feels that Marc sneers at its abstract style, and, by extension, at himself. Yvan - Just a bit younger than Marc and Serge, Yvan is still “finding himself.” He begins the play stressed about his upcoming wedding and looking for a little support. He finds none. Although the physical production of art on canvas means less to him than it does to the others, he is more in tune with the psychological responses and reasonings behind such responses than either Marc or Serge are. That aspect of his personality is what thrusts him into being the middleman in this fight between friends.